Enjoy Caldaro with all of your senses. Surrounded by idyllic vineyards and well away from through roads is where you’ll find our peacefully situated, detached house. 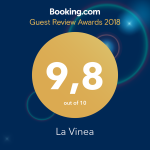 La Vinea is located at the heart of a 10,000 square metre vineyard surrounded by olives, cypresses, beech trees, lavender, pomegranates and fruit trees. A wonderful symbiosis between the experience of nature, privacy and stylish holiday apartments. The location is wonderful, the views unique. The love of nature and the search for a relaxed environment motivated us to create Vinea, from the Latin word for vineyard, as a place of peace, wellbeing and relaxation. Friendly attentiveness in every area.